Ducks Unlimited takes a continental, landscape approach to wetland conservation. Since 1937, DU has conserved more than 14 million acres of waterfowl habitat across North America. While DU works in all 50 states, the organization focuses its efforts and resources on the habitats most beneficial to waterfowl. These regional initiatives, organized geographically, function to connect people and resources with critical habitats, and recognize each region's role in sustaining the future of waterfowl and in achieving DU's vital mission. Learn more about these initiatives. 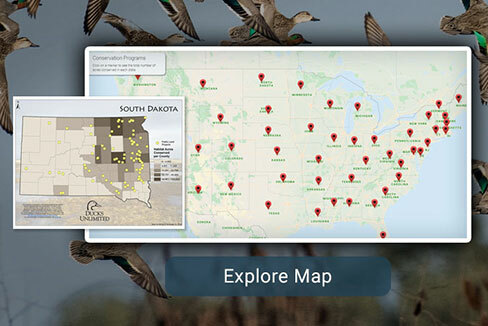 The conservation programs map is an interactive map for exploring Ducks Unlimited conservation programs in your state. Ducks Unlimited habitat projects are in all 50 states, every Canadian province and in key areas of Mexico and Latin America. In total, DU has delivered more than 20,000 conservation projects across North America. Learn more about projects in your state. Click here for a larger project map (jpeg).